For those familiar with the Hubbard community’s arboretum, a quick stroll through the three-acre plot reminds the public of the consistent growth and beautification of the area. But for citizens unfamiliar with the arboretum, it may very well be one of Hardin County’s best kept secrets. The Hubbard Arboretum, located behind the Hubbard Care Center, continues to grow since its creation in the late 80s/early 90s. A local non-for-profit group of community volunteers – Big Green – was created in 1991 and incorporated in 2003. According to Big Green Board Member Gloria Peet, the organization formed in large part to improve and take over ownership the arboretum. Becoming a member of Big Green requires no membership fees, just a passion for volunteer work. Right now, there are 12 members, most of which are Master Gardeners. “Robert and Roberta Boeke owned this land and they donated it to the school. That was in the late 80s or early 90s. There was this arboretum that needed a caretaker. In 1991, Big Green formed and took it over,” Peet said. At the time Big Green took over ownership, the Arboretum was mostly a grass area with a few trees. Since that time, the arboretum has experienced many changes for the better. There are 100 percent handicap accessible sidewalks with cement pads, donated benches for seating, a newer gazebo (built in 2009). The sidewalks connect to the east side of the Hubbard Care Center, which allows residents to use the area as well. In the past year, the arboretum has experienced three more changes according to Peet. “We connected the Care Center from the southeast corner of the Arboretum to the east side of the Care Center. The second thing was building the field stone entry. The third was getting trash receptacles made possible by the Build with Bags grant through the Iowa Grocery Industry Association. The receptacles and liners were purchased through Iowa Falls Plastics Recycling,” she said. While littering wasn’t a huge issue, Peet said if the public does not have receptacles to use, that may be a possibility. The sidewalk connecting the arboretum to the SE corner of the Care Center was made possible due to a $3,000 grant from the Hardin County Community Endowment Foundation. A matching 1:1 grant, Big Green also utilized matching funds from donations and proceeds from the organization’s fall and spring sales. The Build with Bags grant provided nine receptacles and liners. Five were placed inside the arboretum, with four donated to public areas (Care Center, Hubbard Golf Course, Hubbard Library and city of Hubbard). The city of Hubbard placed its receptacle inside the city park. Peet said Big Green is pleased with the new field stone entry way near the intersection of Ash and Lowden streets. That project took between 2-3 weeks to complete, and was done by Harold Hytrek and Tristan Brother. Hytrek is a former masonry instructor at Ellsworth Community College. Rock was used from a rock pile on the late William Schnormeier farm, and donated by his wife Joyce Schnormeier. “We are in the process of creating signage that will direct people to arboretum. We thing the entrance is reat. The lumber on part of the field stone pillars were left over from building the gazebo. 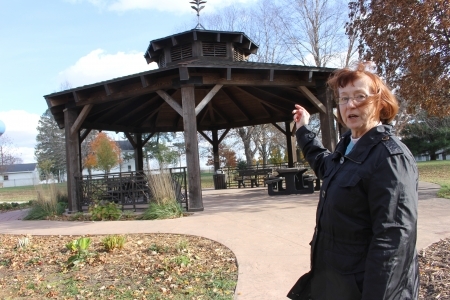 The gazebo lumber was donated by Mark Brinkmeyer, a native Hubbard person who owns a lumber company in Idaho,” Peet said. Like anything, Peet said as the arboretum has become more aesthetically pleasing to the eyes, the more visitors are using it for walking, biking, etc. Other public contributions have led to cement paths with donor bricks, donor bricks around the gazebo, and educational flower bed signage. A flower picking bed is also located on the northwest side of the arboretum. That bed is for Hubbard Care Center residents, family and staff to pick flowers for the Care Center. In the future, Peet said Big Green is looking into installing brick edging around the flower beds. While the group accepts donations, there is a permanent endowment fund through HC Community Endowment. Citizens may also donate by contacting Big Green President Dennis Winter at 641-864-2443. * There are many avenues the public can donate/help add to the Hubbard Arboretum. They include purchasing a brick to be placed around the gazebo, purchasing items during Big Green’s fall/spring tree/bake sales; or contributing to Big Green’s permanent endowment through the Hardin County Community Endowment Foundation. * A donation from anyone living in Iowa to the HCCEF Big Green Endowment Fund qualifies for a 25 percent Endow Iowa Tax Credit. A donation of $10,000 qualifies the donor for a $1,000 Seeds for Success grant from the HCCEF to be given to qualifying endowment funds including the Big Green Endowment Fund.